*Ballylough Minors learned on Friday night that they will contest the Down All County Minor football league final against Burren which was held in Kilcoo on Tuesday night. The St Mary’s club won the league fixture against the Loch back at the start of May which will see them installed as the favourites but the Loch are in bonus territory now and will most surely give it their best effort on the night. With the championship just around the corner the game is a welcome challenge. *The All County Minor Football championship has had to be adjusted due to one of the teams withdrawing. This now means that Baile an Locha will play CPN at home on Tuesday 7th August followed by Kilcoo away on Tuesday 14th August. The top two teams in the now group of three progress to the quarter finals on Tuesday 28th August. 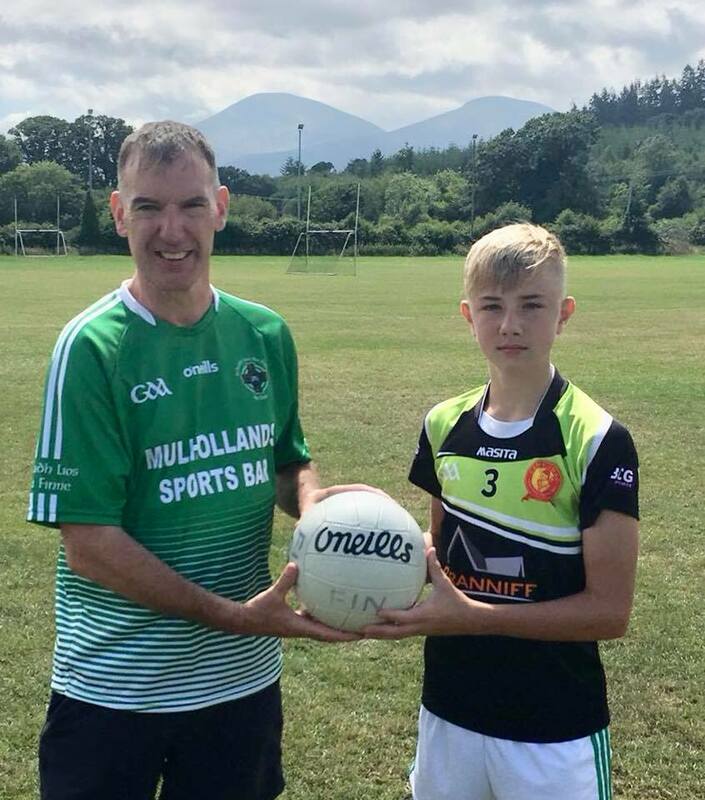 *Good luck to our U16’s footballer & Baile an Locha minor goalkeeper Morgan Croskery and his team mates in the Gerry Reilly game against Kildare this Saturday. *Our U12’s were awarded a walk over victory against St Paul’s who were unable to fulfil the league fixture on Sunday morning. The result means our boys are in joint third in the league standings with one final game to be played at home to Kilclief this weekend. *Our U16’s missed an opportunity to go top of the league with a reversal away to parish neighbours Castlewellan. The Town made light work of a Fin side who had several players unavailable for the fixture. The management will hope to have most of the squad back for the final two league games against Saul. *The Kellogs Cul Camp was a resounding success with 42 kids registered this year. Down one on last year but we will have seven attending the St John’s camp next month. Thank you to our lead coach Ambrose Rogers and fellow coaches, Ciaran, Niall, Finn, Kirsten and Megan. Also thanks to our camp co-ordination team of Gerard, Louise and Jenny and also for further help during the week of the camp from Sheena, Shauna, Ellie, Eugene, Rory, Colin & Claire. Next summer the camp will run from Monday 15th to 19th July so put them dates in your diary. 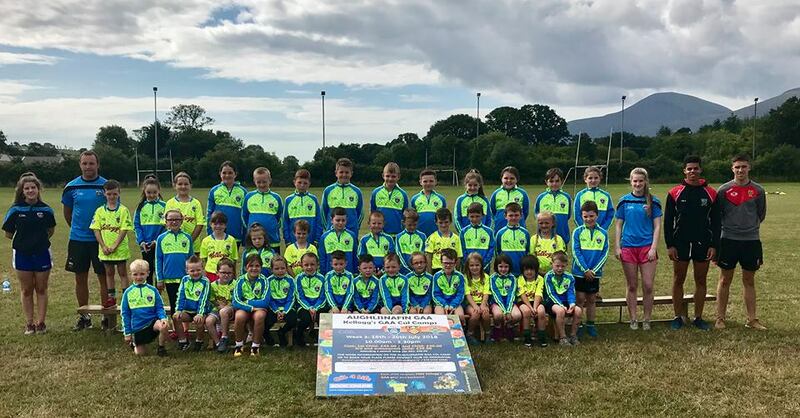 Aughlisnafin GAC hosted the Kellogs Cul Camp last week at Pairc Baile Anna. *Upcoming fixtures Seniors v Mitchels (a) 7.30 pm this Friday; U12’s v Kilclief (h) 11 am this Sunday; U16’s v Saul (h) 12.30 pm this Sunday; U14’s v Kilclief (h) 7.30 pm next Monday. Peter OHare presented the match ball on behalf of his father Gerard OHare Plumbing & Heating for the recent senior game against St Pauls. *Our Year 6’s will travel to Attical GAC this Saturday for their 9 aside football tournament. Games commence at 10.30 am.